About a week ago, it seems that Google has done and lost a little weight. 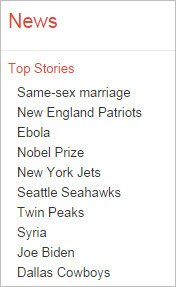 The Google News home page lost a feature that let you quickly view trending topics on the left hand side bar. Even though it’s been a week since this happened, and reports began coming in since then, Google has just recently replied within the past 24 hours in a forum thread. For the time being, people will have to just settle with Google Trends.